1890's (GUARANTEED - NOT A REPRODUCTION). 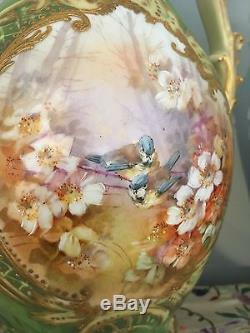 HAND-PAINTED BAYEUX (MADE IN FRANCE) PORCELAIN VASE. 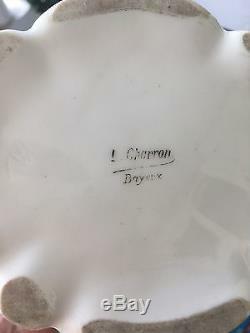 BAYEUX PORCELAIN WAS COLLECTED BY. FAMED DESIGNER YVES SAINT LAURENT! 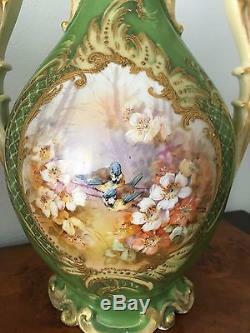 PEERLESS POLYCHROME BIRD & FOREST SCENE WITH FLOWERS. DEEP COLOR SATURATION, STRIKING HIGH-RELIEF GILDING. SINUOUS BRIGHT GREEN BODY WITH PIERCED OPEN-WORK LIP. ELABORATE TENDRIL-FORM GILT-WASHED WHITE HANDLES. 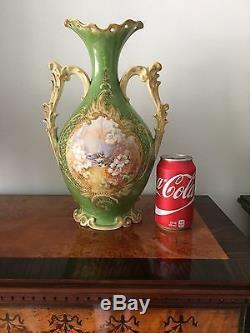 A UNIQUE & STUNNING ANTIQUE VASE - ONE OF A PAIR. 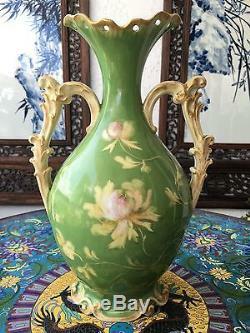 This 1890s ARTIST-SIGNED & MAKER-MARKED bright glowing green (high-fire glazed) FINE GENUINE PORCELAIN pictorial vase - with. 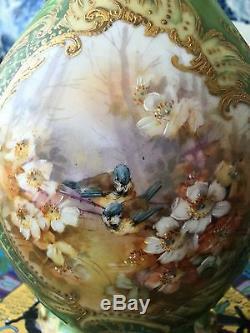 A hand-painted forest & bird scene rendered in a vibrant rainbow of colors enclosed in a high-relief golden cartouche - is a. Treasure of Old World French Sevres-style vase-making from the Bayeux factory in France. The 1890s date is not a "circa" estimate or guess, but a certain date of manufacture, based upon officially-published. Provenance , included with the sale. 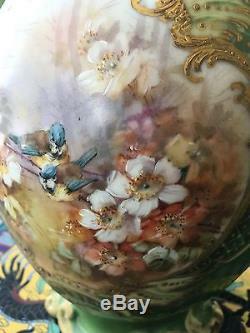 THIS IS A BEAUTIFUL & GENUINE 19TH CENTURY, 1800s HAND-PAINTED & GILT ANTIQUE FRENCH VASE IN UNBROKEN, BEAUTIFUL CONDITION! Backed by a sultry, shadowy purple-blue forest theme to accentuate the masterfully-rendered central avian (bird) theme in vivid. 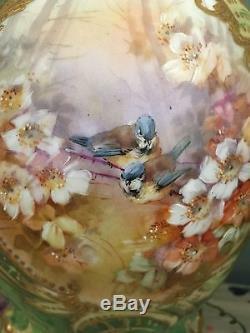 The naturalistic illustration of this vase is its main attraction. Already fine, green-glazed & gilded flower-shaped body form with elaborate double-handles (rendered & gilded in signature Bayeux porcelain manufactory style). The bordering of the forest bird. Scene with blooming flowers & heavy three-dimensional ornate gilding (probably pate-sur-pate) merely underscores the regal. Stature of these vases , and how well they will fit with even the finest decor - on a mantle, bookcase, display cabinet. With its origins stretching back to 1793 in Valognes (Bertiniere/Masson), the Bayeux porcelain factory's famed Langlois period began in 1802 (Joachim Langlois, who had direct experience at Sevres, and brought this sensibility into Bayeux's style, where it remained for the better part of a century, as still seen in this vase), before the Bayeux porcelain factory was established, as such, in 1810 in Calvados. Saint Laurent's collection, however, was not the Asian style, but instead, traditional French themes - as seen in this vase for sale here, today. These sales establish the proper price ranges for this fabulous, ornate vase (Saint Laurent was famous for enjoying lush, opulent decor), which is more beautiful than any of the Bayeux vases I've ever seen - the hand-painting is impastoed and truly fantastic. (1) PREVIOUSLY FROM USE AS LAMPS (DRILLED-OUT), WHICH DESTROYS ALL SERIOUS COLLECTOR VALUE (OR MADE AS LAMPS, WHICH IS JUST AS BAD - NOT SERIOUS, FINE VASES). (2) SERIOUSLY DAMAGED, UGLY, SMALL, UNSIGNED, OR SECOND-RATE IN ONE WAY OR ANOTHER. Therefore, these are not price comps for this fine vase. Estate sale and has been in my family ever since - for nearly 80 years, one collection. PLEASE SEE PHOTOGRAPHS FOR EXACT CONDITION : 100% RAW UNFILTERED, UNEDITED, AND UNENHANCED PHOTOGRAPHS! Taken with an IPHONE & THAT'S IT. USE THE QUESTION BUTTON FOR ANY OTHER INQUIRIES! REMEMBER THAT THE PHOTOGRAPHS ARE A PART OF THE DESCRIPTION! NO PHOTOSHOP, and NO FILTERS were used at all! Again, as my 19-year feedback history with HUNDREDS of 100% positive reviews and incredible PERFECT 5-STAR DSR's demonstrates, I sell to high-end clientele, honor my commitments, and put my customers needs first, as friends!! YOU WILL NOT BE DISAPPOINTED WITH MY TRULY HIGH-END MERCHANDISE!! ALSO NOTE : My descriptions are all personally written BY ME, and reflect a lifetime of experience in art, jewelry and antiques. 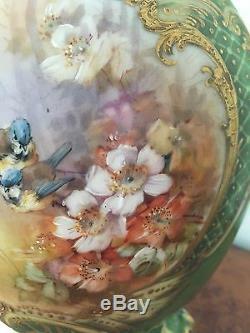 The item "+ 1890s BAYEUX PORCELAIN VASE! SEVRES GOLD+" is in sale since Wednesday, August 2, 2017. This item is in the category "Antiques\Decorative Arts\Ceramics & Porcelain\Vases". monet" and is located in Newport, RI. This item can be shipped worldwide.